Prior to the folk revolution of the early 60's, when soloists like Joan Baez and Bob Dylan ruled, folk songs were largely performed by groups. 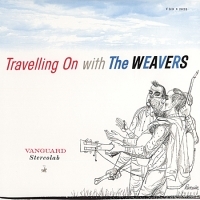 The Weavers are easily the most famous of these vocal groups. The original quartet of Ronnie Gilbert, Fred Hellerman, Lee Hays and Pete Seeger formed in 1947. A successful career with Decca soon followed. The group was forced to disband after being blacklisted but came together again in 1955. The recording of their legendary Carnegie Hall concert is one of the most celebrated ever made. Pete Seeger left the group to pursue a solo career and Erik Darling took his place. Seeger soon returned and the group continued with varied members until their final break up in the early 60's.